IMPACTED by high labour costs, regulatory burdens and spiralling energy charges, the cost to operate within the Australian beef processing sector ranks far worse than international competitors, and threatens the very viability of Australia’s red meat export sector. That’s one of the key conclusions found within an important independent report into the cost to operate within the Australian beef processing industry, released by the Australian Meat Processor Corporation this morning. In fact the comparisons drawn between Australian processing costs and those in export beef competitor nations like the United States, Brazil and Argentina are far worse than anecdotal figures previously used across the industry have suggested. The report, compiled by respected economist, Selwyn Heilbron, identifies and quantifies the international comparative costs burden faced by the red meat processing industry in Australia, and compares them with key international competitors in North and South America. The study compares three main cost areas – labour inputs, utility costs (principally energy), and government inspection fees. The results exposes an urgent need for government to recognise and respond to the excessive regulatory burden faced by Australian red meat processors compared with their main international competitors. Of the costs incurred in Australian processing, the report estimated that more than 54pc were due to some form of government regulation, significantly higher than any of the three comparison countries. Australia’s regulatory cost burden is estimated to be 2.75 times that of Brazil, 2.4 times that of the United States and 1.89 times more Argentina. As an example, in all three comparison countries, the post-mortem meat inspection charges are considered part of the ‘public good’ for food safety, health and export income purposes, and are therefore paid by the respective governments. In Brazil these costs are fully-funded by the Federal Government and not passed onto the processing sector. In contrast, the Australian government operates on a full cost recovery system estimated to cost the red meat industry about $110 million each year. Despite furious lobbying by the broader red meat industry, Australian red meat (and that of other commodities) export inspection subsidy was withdrawn by the then Labor Federal government around 2010. There is a general view across the industry that that additional cost is ultimately passed back through the supply chain to producers in terms of livestock prices. Labour-related charges were the biggest area of disparity found in the analysis between Australia and other exporting countries. In Australia, labour-related costs comprised more than 58pc of total operating costs, while the figure is considerably less than 50pc in the other countries. Utilities-related costs are also substantially lower in both the US and Argentina in absolute dollar values, per head of throughput. Data collected for the study was for the 2015/16 financial year, but Australian energy costs have risen significantly since then, so the current comparative gap is almost certainly even wider, the report found. One of the report’s key findings was that regulatory changes to labour, utilities and certification costs could transform the competitiveness of the Australian beef processing industry and reduce its operating costs by up to 5.5pc. “This could bring $700 million back into Australia’s beef processing industry – currently estimated to be worth $1.4 billion – and transform its prospects for investment, long-term income and employment,” the report said. The report points out that almost 70pc of Australian red meat production is exported, finding its way into more than 100 importing countries. “Export processors are dependent on a global marketplace for red meat for the viability of their industry, however they have a limited ability to effect the market price received for their products due to the intense pricing competition from competitors,” it said. “Cost competitiveness on a comparative basis is therefore critical to the Australian industry for it to maintain market share and ultimately, is the key for meat processors to remain profitable. The impacts from lack of competitiveness in cost-to-operate could be felt right through the supply chain, the report said. “The increasing competitive cost pressures arising from the supply characteristics of a drought and future directions of the global beef trade are compounded by the domestic hurdles that the Australian industry faces, as well as the ongoing competition for economic resources (like labour) which processors face in the domestic Australian economy,” it said. The two tables published below provide the report’s summaries of cost comparisons in A$ for comparative operating cost structure and comparative regulated cost. The table above shows that total operating cost (excluding livestock purchase) in Australia were about $360 a head, compared with $290 in the US, $172 in Brazil and $206 in Argentina. On a cost per kg of beef produced basis, Australian operating costs accounted for $1.22/kg on a hot standard carcase weight basis, compared with 80c/kg in the US, 70c/kg in Brazil and 92c/kg in Argentina. In comparing regulated costs in the table above, two of the three components – labour and certification costs – were dramatically higher in Australia than in competing exporter countries, while utilities related costs were somewhat similar. Total regulated costs in Australian processing were about $195, or 54.1pc the total cost component (ex livestock purchase). The US was about $89, or 30.8pc; Brazil $61, or 35.6pc; and Argentina $89, or 43.4pc. Data collected for the report was for the 2015-16 fiscal year, to ensure consistency across all four countries examined. 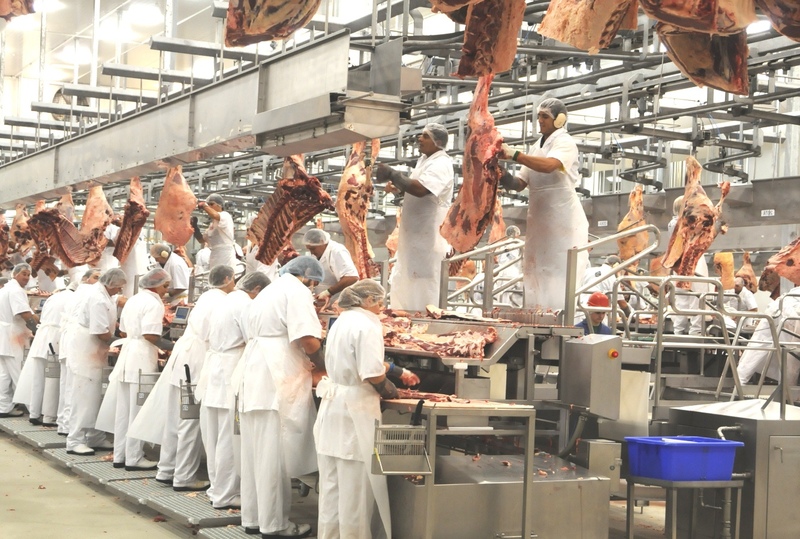 The report emphasises the impact that the red meat processing sector has on the overall Australian economy, especially at a regional level, employing more than 126,000 full-time equivalent personnel, including flow-on effect, representing 1.3pc of the nation’s total full-time equivalent employment). Click here to view summary of recommendations from the report. Regardless of who is carrying the can, it is in the best interests of all supply chain participants to address issues affecting the competitiveness of our product. As an industry we have often worn the cost of the regulatory burden in the belief that we are being advantaged by having higher standards and protocols than our competitors. As a beef producer I am in total support of negotiating an advantageous position for our product in what is an encreasingly competitive market place. I would ask our politicians and bureaucrats to justify some of the outcomes that they have resided over recently, the certification fiasco which led to the shut out of most of our plants with China chilled access is an example, has this affected the outcomes in regard to the further China chilled access which was announced in March last year? The current situation that we may well lose access to part of the EU 481 Quota is possibly another example. It is my understanding that those in charge of negotiations say it is decision between the EU and the US (regardless of the fact that it is described as a non-descriminate quota in the MOU), and if we were to prosecute our position strongly we put at risk a favourable EU FTA, given the recent media comments attributed to an individual that may influence that outcome, I personally would put little faith in an favourable outcome there. What is the point of continuously looking to improve eating quality along with standards as a point of difference to our competitors, if we allow the cost to operate reach a level where we simply can’t compete? As producers we are constantly critising the actions taken to address the slide in beef consumption domestically, maybe we should be asking the politicians and bureaucrats to address the competitive advantage that no Tarif, no quota, subsidised European pork has? Given that the previously mentioned EU representative mentioned things such as morals and protectionist policies, I think it is time for a stronger diplomatic effort!. As stated in the report, the lack of cost competitiveness in the abattoirs is passed back to cattle producers by paying lower prices for our cattle. Again it is up to the producer to carry the can for the inability of processors to compete internationally. So sad for the last manufacturing sector to potentially move off-shore like clothing, textiles, footwear, cars etc. it is time to determine why? And what is the economic future of a country that provides so much to those who are unable or unwilling to contribute? Money does not grow on trees!